Earn $1.39 in VIP credit (139 points)What's This? When conditions are at their worst and only maximum puncture protection will do Continental PLUS breaker is the reliable answer. The PLUS breaker utilizes an extra-duty, highly elastic casing belt that is virtually impervious to road hazards. What this means is you get a lively feeling tire with out all the extra weight of a tire liner but the added protection to get you where you want to be. Smooth center for low rolling resistance and a more pronounced side tread for water dispersion and extra grip in the rough stuff. Also features a reflective sidewall stripe for added visibility in low light conditions. Wire Bead. 700c (622 ISO) Sizes. 610 grams (700c x 32). I bought a closeout Novara Randonee in early 2015 with these tires installed (70032). The rear tire started showing orange wear-through around 3000 miles. In that time, I'd had one flat on it. I replaced it with the same model. I replaced that tire after 3700 miles. No flats. I replaced THAT tire after 6300 miles. It was showing quite a lot of orange at that point, but STILL no flats. I've got about 4000 miles on the current rear tire. I should start keeping an eye on its wear, I guess - I've got a full fender on the back, so I don't see it when I'm riding. Now, I ride on a rail-to-trail that's paved over some of its length, gravel-screened over some, with few road crossings and not a lot of trash. I expect I'd get more flats if I did a lot of road miles. But I've been beyond impressed with these tires, and I'll certainly keep buying them. To the mounting problems other users have mentioned these are a LITTLE hard to get on, but nothing out of the ordinary in my experience. It may be that my rims are a little looser than some others, or it might be a temperature thing (I've usually changed them in warm weather). I got this tire with winter city riding in mind. I wanted to balance aggressiveness of the tread, price, and what could fit on my bike (limited by the brake bridge to 32mm). this tire has done great for me in city riding throughout the winter, light snow (1-2in), slush, or hard-packed snow this does handles the conditions pretty well - so very pleased with its value. I purchased the 700c x 42mm tires. Tire grips the surface well and appears to be of good quality. Have not ridden much since getting the tires but the few times I have the ride seemed solid. Also, I purchased Continental tube and installed both at same time. Tire fit snug on the rim, more than my prior tires. Had to use tools to install them. Anyone not familiar with right way to install tubes in tires should read and follow the directions on the website. It was helpful to me. Since putting air in the tires over 2 month ago, I am still riding on the same fill. Hardly lost any air which is surprising. I bought the tires on sale, I think 25% off list, so definitely a good deal for me. Have these on my hybrid around town bike. They have worked well on wet roads. Can't comment on durability yet but Conti's are generally good quality tires. My new favorite commuting tire. I use these tires on my commuter bike. They look great. I have the 37mm width ones, and they measure 34mm with 70 psi. If they are as good as the Continental Country Plus tires I've used, flats will be very rare. I personally maintain my own fleet of bicycles, have built bikes and wheels from the ground up. I've mounted tires hundreds of time. This tire I bought for my commuter because of the reflective side walls and thick tread. But I have ruined dozens of tubes trying to mount this tire which frankly does not fit a 700c rim. Regular tire levers just snap so went with steel reinforces ones. They are plastic covered so they don't snap but it's nearly impossible to mount the tire without cutting the tube. Finally threw the tire away after using up 4 others on the road. So I gave them a chance. The Continental Gatorskin mounts perfectly fine on the same rims. I don't know why Conti got this tire so wrong, but they won't change it. Save yourself a lot of frustration and do not buy this tire. Thanks for your feedback on the tires! This is the first we have heard of someone having extreme difficulty installing these tires. It sounds like you disposed of them at this point, but we would be happy to answer any fitment questions you may have regarding tire/rim options in the future. Please give us a call or email at your convenience and we will help get you back on the road. Got my product quickly, competitive prices. Unusually narrow at the road, incredibly difficult to install and remove. Full-time bike commuter in Detroit. Ride somewhere around 150 miles per week. There's plenty of road debris around here to slice through tires and these resisted punctures fairly well. They are also moderately fast. Those are really the only compliments I can think of, though. They contact the road about as wide as a 25mm tire would. By far the narrowest 28mm labeled tire I've owned. They also feel a little squirrely. Perhaps due the the limited tread hitting the pavement when I'm used to 28mm & 32mm tires on most of my bikes. I prefer a stable-feeling tire when riding in the city, especially with a somewhat heavy load in my panniers. I also feel like how narrow they are, in comparison to their rim contact width, is what makes them ALMOST IMPOSSIBLE TO MOUNT OR REMOVE. I literally wore my thumbs raw each time I had the displeasure of working with them. 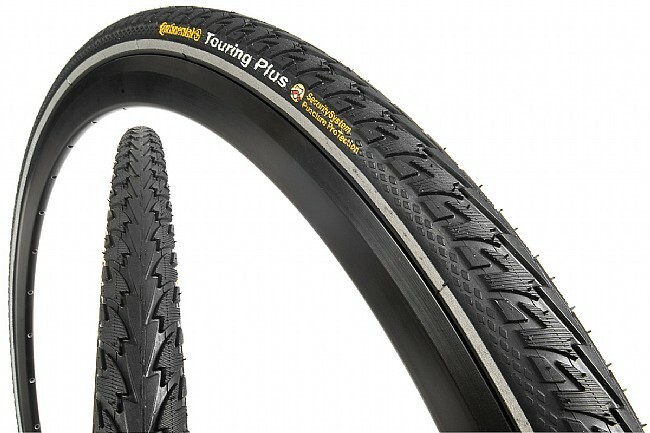 Seriously, I've owned almost every commutingtouring tire you can name, and these are the least user friendly, BY FAR. Just inexcusable. Even using a Kool Stop Tire Bead Jack, which makes easy work of tough-to-mount tires, these tires are a beast to mount. The last time I got so frustrated I literally gave up and tried again the next day. And, to top it off, they're incredibly ugly tires, from all angles. I'd by no means pick a tire just due to it's appearance, but I'll definitely choose an attractive tire over an ugly tire of equal performance for my vintage bike. So, I'm going back to Panaracer Paselas for now. Fast, stable, grippy, lovely. With the new ProTite version, they may just have enough flat protection for Detroit streets. This is my fourth set of these tires,and have never had any problems at all. The price is great and always get them them delivered to me really fast.So as long as they are available i will be purchasing them! I live in chicago so they are a great street tire. A very good tire for our long distance touring trips, performs well loaded, and provides good traction. Seattle to Portland twice, Seattle to Florence Oregon, SF to Cedar City UT. Good load carrying characteristics, good traction in all conditions and riding surfaces. My go to tire. I have been riding working on bikes for nearly 40 years and this is by far the toughest tire to put on the rim I have ever dealt with. I had to use two carpenters clamps to hold the tire in place as I pried popped the tire over the rim. I used my heaviest tire tools and put on safety glasses because I thought the tool would snap in my face. A decent tire once installed but I am not sure what I will do if I ever get a flat out on the road.... ?!?!? Overall, great tires and good quality for the price! Exelent tire. Already saved me from a couple of flats. I take a 4mile bike ride every day. great tire for the price! Recently purchased these tires in a 42mm. Using them for urban and light touring. Great tire for the price and easy install. They seem to roll very nice with little resistance. Purchases for wet weather commuting and short winter training rides. The good - reasonably durable and good value. The bad - sketchy handling, actual width closer to 25mm and not the advertised 28mm. Spend more money & get a tire less prone to being punctured by virtually nothing. I have accumulated 3,206 miles on a set of these tires. I rotated them once about 1,500 miles ago. No flats, run true, mount easily (for me at least)and are only now showing wear in the center. No visible warning treads as yet. Mine are 700 X 37's. Price and weight are very competitive with Panaracer's and other similar no flat tires. All of my mileage is in bike lanes where the usual trash accumulates from cars. Have run over glass, nails, staples, tin cans, et al, with no issues. Seattle is in the midst of a building boom and my daily commute takes me through the heart of the rough pavement, steel plates, gravel, gratings and more. The tires are great - smooth riding through all these challenges. They work well in the dry summer months and our three other very damp seasons.